When it rains it pours. That’s certainly been the case here in Connecticut, where the past few months have brought weeks of torrential downpour (and I thought we’d left the rain behind in Seattle! ), along with—on a much brighter note—several unexpected opportunities to promote The Lucky Ones. Shortly after I completed my piece for the Gordon School, I heard from a friend and old writing partner at 826 Seattle, a non-profit founded by Dave Eggers that offers writing classes and tutoring to underprivileged youth (to date there are eight 826 centers around the country). We’d like to include an excerpt from your book, Alicia said, in our 2014 Anthology, What to Read in the Rain. Susan Orlean will be contributing a piece this year, Alicia added, so you will be in good company! 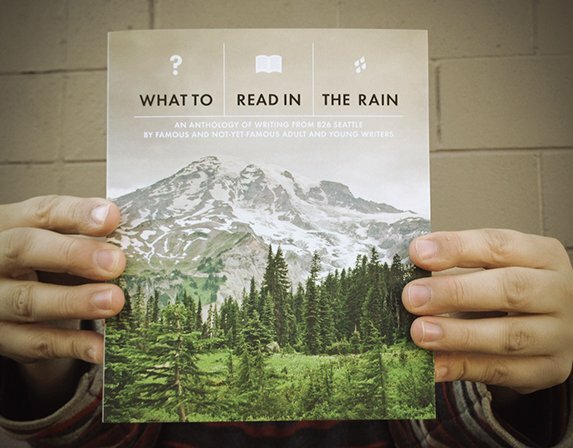 What to Read in the Rain features famous and not-yet-famous adult and 826 Seattle student writers. Wow, I thought—what an honor to be included in it. 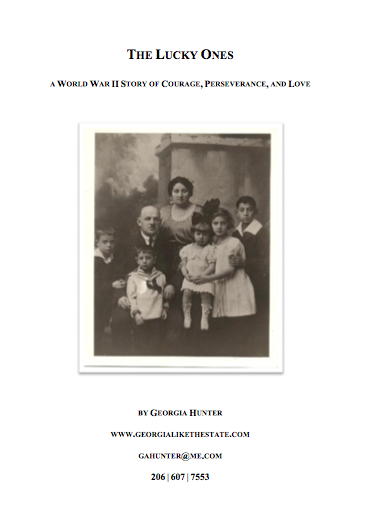 I’m in the process of finalizing my contribution (a chapter capturing my great-aunt Mila’s attempt to escape the Radom ghetto with three-year-old Felicia in tow). When the anthology is published in December, it’ll be available to visitors at the 826 storefront (and online), and distributed to several Seattle-area hotels—it’s crazy to think that complete strangers will soon be able to find a snippet of my family history on their bedside tables! Soon after my correspondence with Alicia, my aunt Kathleen, also a writer, told me about a contest put on by the Whidbey Writers Workshop MFA Alumni Association. I’m a big believer in submitting to contests—they give me a reason to polish my work, and to get excerpts of The Lucky Ones in front of a new audience of critics—a rather terrifying prospect, but that’s the goal in the long run, right? Kath and I each submitted the first 25 pages of our books, and to our great delight, we were both selected as Top 25 finalists in June. Neither of us could believe it when, a few weeks ago, we were both again selected, this time as Top 10 finalists. My heart leapt when I got the news. Top 10! How in the world did I make it that far? But there was a caveat: in order to qualify as a finalist, I had to submit a complete (key word complete) manuscript by midnight on June 30th. I was still four chapters from finishing. With a newly lit fire under my Aeron, I made it my mission in life to complete and polish my book…in a week. 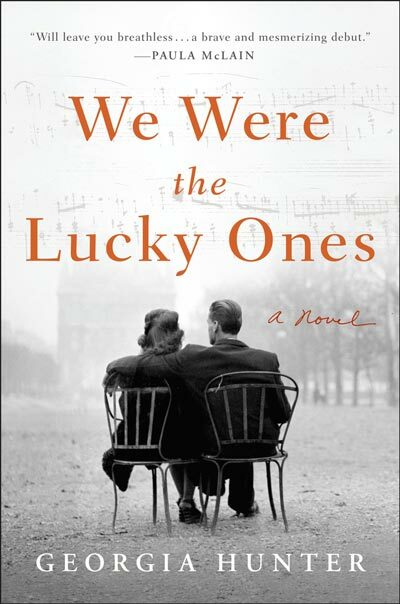 By the time I sent off a complete draft of The Lucky Ones, I could barely see straight. 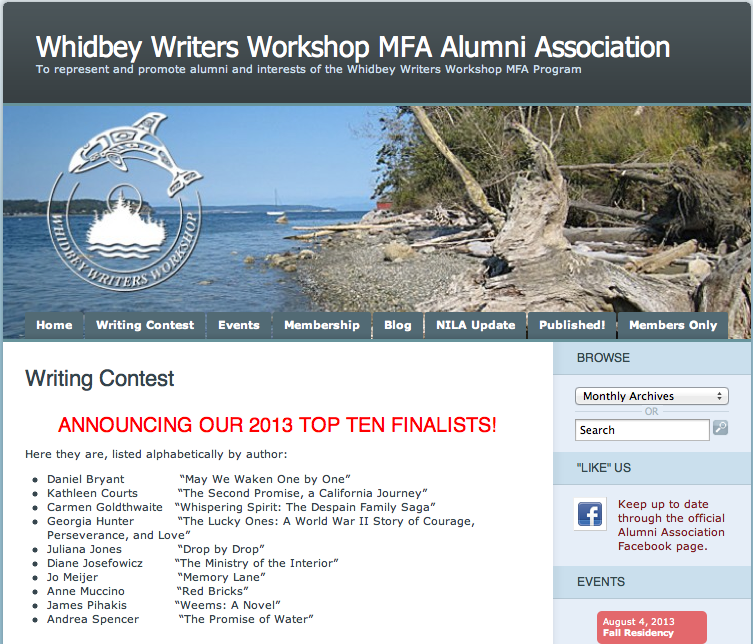 But boy did it feel good to see my name—and Kath’s!—listed as finalists on Whidbey’s site. Kath and I and each of the eight other finalists are currently being read and judged by novelist, poet, and short-fiction author Rikki Ducornet. We will also receive two critiques by members of the Whidbey Writers MFA Alumni Association, which is exciting—at this stage, feedback from someone who’s never heard of me or my story is priceless. And scary. But mostly priceless. Indeed, the last few months have been rife with unexpected opportunity (and along with it, an unexpected boost of progress and potential) for The Lucky Ones! My book—my family’s story—is no longer a mess of words spilling from my notes to the page. It’s out there, for the world to see. Feeling real. I have my editing work cut out for me, plenty of it, but it’s thrilling to think that when it comes time to pitch to agents (the goal being to do so this Fall), this new Whidbey distinction along with my 826 entry will help to give me a leg-up, to distinguish my query from the dreaded slush-pile. Until then, I’m going to take advantage of the embers still burning hot beneath my chair, and get back to work. The title page of my manuscript, submitted to Whidbey on June 30th. I decided at the last minute to include a few photos.